A new weekly installment, the Wednesday Warren Warning, as in Elizabeth, the progressive phenom-du-jour. Given her potential as the most recent flash in the pan for progressives, this may be a short-lived weekly episode post. In an article on National Review, Jonah Goldberg points out the hypocrisy of Warren regarding the Export Import bank, which subsidizes big business at the expense of taxpayers. Heritage Action (the activist arm of the conservative Heritage Foundation) invited Senator Elizabeth Warren to speak at an event dedicated to phasing out the Export-Import Bank. The Ex-Im, as it’s known inside the Beltway, has become a favorite target of populist forces on right. The obvious conclusion: Warren as populist as she wants everyone to believe - she wants to keep funding big businesses. It's a target almost everyone can agree upon, but she won't take action. She doesn't want to be in bed with her political foes, even when there is common cause. So there must not be common cause. As Goldberg points out, the progressive movement, or its leadership at least, doesn't want to destroy big business, it wants to subjugate it. They likely figure a few big businesses are more easily brought to heel than a plethora of small businesses. So progressives like Warren are happy to feed the few, at the expense of taxpayers, in order to keep them on a short leash (to continue with Goldberg's analogy). The other obvious conclusion: Warren is certainly no post-partisan. She's an all or nothing candidate - no compromise with her will be possible. That's not because she's a progressive and has no ideas the right can tolerate (though there would be very few), but rather because of her intransigence. It will be her way, or no way. 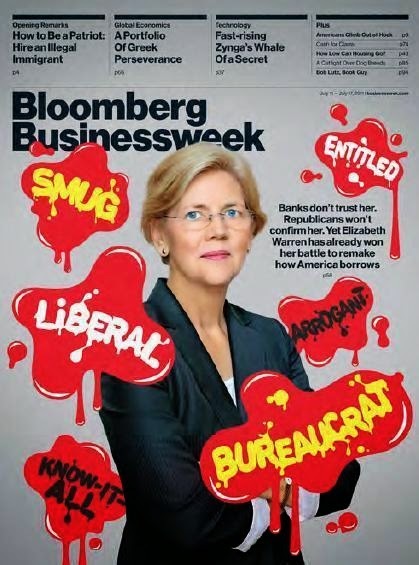 A Warren presidency would leave those of us on the right pining away for Obama as a king of compromise. Warren would make Hillary Clinton seem far more palatable by comparison. And maybe that's the underlying ruse of it all anyway.